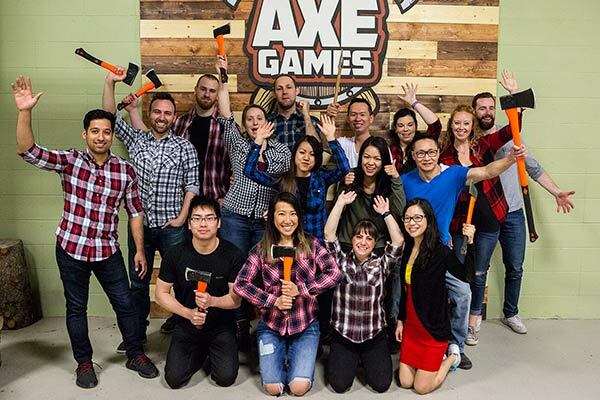 Omaha Team Building: Axe Games hosts events up to 40 people! The Axe Games facility can host axe throwing events for groups of up to 40 people. We are a great venue for Omaha team building, birthday parties, or bachelor and bachelorette parties! To check availability & book please take a look at our: online booking page. 2 fun activities for under $40! Bring up to 40 people. Everyone in the group plays a round of axes (75 min) and a round of combat archery (75 min) – individuals have the option to play double of one activity if they prefer not to participate in one of the activities. From under $25/person (Up to $600 in potential savings)! Extra players (over 40 people) are $20+tax/pp extra, please contact us if you have more than 40 people, as we will need to make special accommodations for your group.